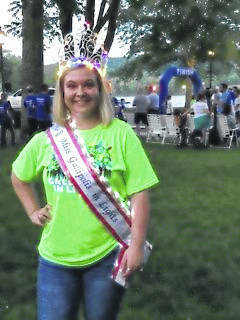 Miss Gallipolis in Lights Alexis Wothe stands near the Electric River Run and Walk 5k Saturday. Overall male winner, Nathaniel Abbott, had a time of 17:35.7 and a pace of 5:40. Sarah Watts had a time of 23:21.1 with a pace of 7:31.